This top chef has honed his skills and grasped his strengths and weaknesses. Putting his palate to the test, Josh has truly concocted something buzz-worthy with this new concept: Helm. He is the chef behind the Bistro Group, Savage, The Test Kitchen and soon-to-open, Burgers and Bits at The Grid, Rockwell. What sets Helm apart from these concepts you might ask? Blood clam broth, pandan and cilantro oil. Located right beneath the relatively new Savage, Helm is an intimate chef’s-table dining experience that only allows for 10 diners at a time. Josh tells us that Savage is where he goes back to basics, no bells and whistles; it is where he cooks what he likes to eat when not ‘working’. On the other hand, at Helm, his creative juices run wild and free. “Helm is very intimate, and its food more finicky. Helm’s dishes are delicate and refined" says chef Josh Boutwood. Decadent, whipped, rendered pork fat seasoned with leeks and topped with chicharon and served with house made bread. Here, Josh makes what he enjoys cooking when he puts his chef’s hat on, both literally and figuratively, because he can challenge himself, experiment, and push boundaries. This is his playground. Fall-off-the-bone soft pork rib with fried blood and pineapple gel. Flattened potato cooked in dried fish dashi with kamote chips and fried kamote leafs, dusted in cured dried scallop. Its name stems from “navigation”; it means: to steer a ship. To Josh, this ship is rooted in Filipino heritage. He aims to show us that with a menu focused on locally sourced produce and ingredients, he can steer us anywhere. "We always let the ingredient tell us how to work with it, and what it needs"
Helm’s 10-seater experience is designed so that he and his team can interact with guests and make the meal more meaningful. In this clean, minimalist space you will find wooden chairs and simple interiors, a subtle backdrop that allows for each bold and confident dish to shine. All diners get a seat at the white marble wrap-around kitchen counter where each can watch the chefs’ every move. Josh himself is cooking, plating, chatting, and passionately explaining his food pairings and ideation. Unlike his other concept, The Test Kitchen, which is highly seasonal and dependent on market availability, Helm’s menu does not change daily, but every four months. 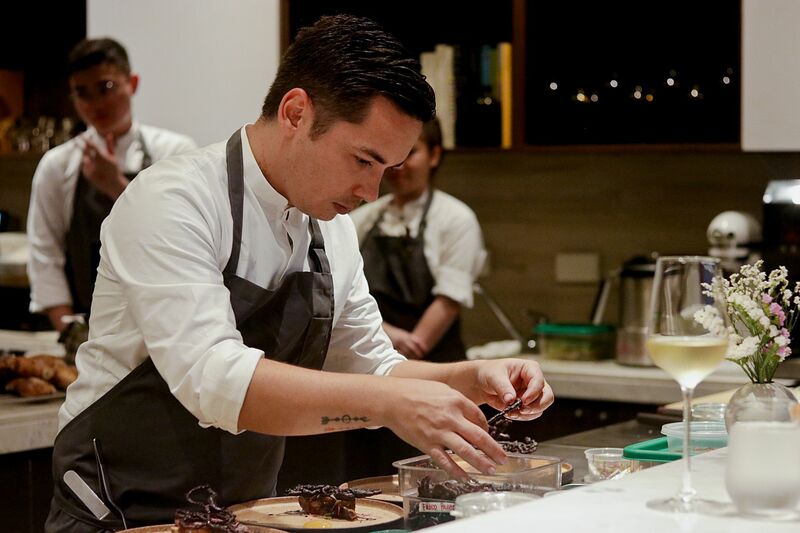 Josh does not focus on one specific cuisine with Helm, instead aims to grasp global flavours with every new menu, currently highlighting Filipino ingredients. Succulent piece of duck from laguna cooked in charcoal, duck cured egg yolk, pickled coconut, lemongrass, cilantro oil topped with a chili leaf. What elevates this restaurant and what sets Josh apart from many other cooks is his ability to edit and show restraint. His food is complicated, yes, but every item on the plate serves a purpose, communicates a message, adds to your palate’s journey and the menu’s progression. "The process can be brutal in its simplicity but always elegant in its symmetry"
Kitayama beef short rib braised and smoked with beef jus and tamarind, paired with Adlai. This is accompanied with strip loin that is pan seared, paired with seven-mushroom paste cooked down to bring out the umami flavour. “My thought process is that I think in triangles and in threes. Three is a beautiful number for me. When creating a dish I think of three core ingredients that I want to use and manipulate at each point of the triangle to create a balanced centre. Sometimes the points are ingredients, sometimes flavours or even textures. My challenge is to find the equilibrium within a dish -- that sense of balance between each point. The process can be brutal in its simplicity but always elegant in its symmetry." Mangoes with green mangos macerated in sugar. Warm custard made from duck egg yolk dusted in cashew nut powder and cosmo flower to garnish, paired with duck egg white meringue. This soon to be hot-spot is expected to further elevate Manila’s thriving culinary landscape. Make sure to reserve a seat, soon! Chocolate filled with pili nut butter, yema, meringue with miso caramel. Chocolate and durian spun into a creamy ice-cream, accompanied by three textures of milk: burnt milk gel, burnt milk skin and milk wafers, topped with palm sap syrup.